South Wedge Mountain is situated on the eastern border of The Enchantments. 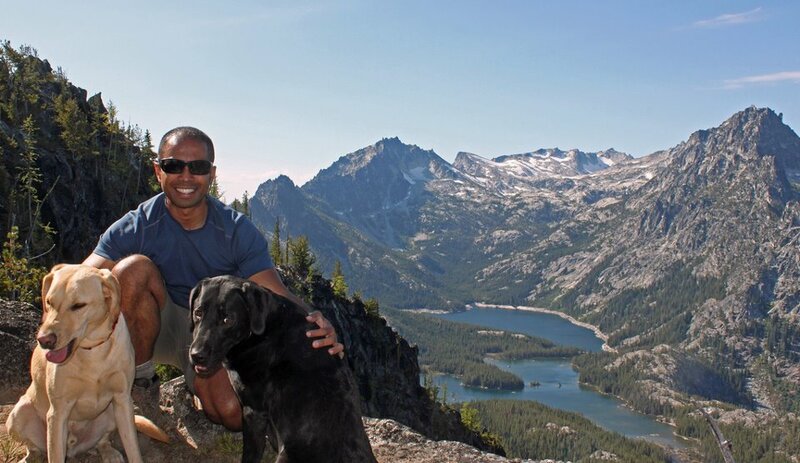 The mountain provides panoramic views of the Lower Enchantments, with limited view of the Upper. Friend and I had been talking about hiking the mountain for for months, but we’ve been putting it off due to snow conditions. The hike came a week after my first visit to The Colchuck/Core area of The Enchantments. To my surprise, I was able to get my other friend Tan to come along. Meeting at 5 AM to hike isn’t ideal for most, but he was right on the dot! We met Tom and his friend at the Buckboard Cafe in Peshastin at 7 AM for breakfast, then drove to the trailhead and started hiking by 8:30. What we thought was going to be a scrambled turn out to be a pretty structured hike, with a hikers’ path nearly all the way to the top. The weather was gorgeous to say the least, and the views into The Enchantments were just stunning. Although I didn’t get the chance to walk though Lower Enchantments this season, it was just as rewarding to see the area before the snow hits. Overall a relaxing hike and a nice break from work on the Bulger List all summer long. Tom was gracious enough to give Tan and me a lesson on trail navigation with maps and a compass—quite education! We got down to the cars in mid-afternoon, then stopped in Leavenworth for some refreshments.